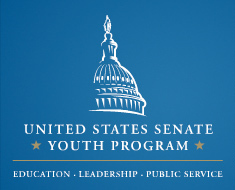 The United States Senate Youth Program sends two delegates from every state to spend a week in Washington, D.C., where they study our government firsthand. There is also a $10,000 college scholarship for each delegate. The 2018 program will be March 2-9, 2019. High school juniors and seniors are eligible to apply. Students who are interested should look over the criteria in the USSYP 2019 Brochure​ and then contact Mr. Peppers for an application. Each school system may nominate one candidate to the state level. The process by which they select that candidate is up to them. After the applications are received and scored, each candidate will be given the USSYP Qualifying Exam, which consists of five sections of questions on politics and government and one essay section. The top-scoring candidates will be interviewed. Two Delegates and two Alternates will be selected.